Successfully Added ThiEYE i60 4K Action Camera - 4MP SONY CMOS, 1.5 Inch TFT Display, 152 Degree Lens, Wi-Fi, Image Stabilizer (Silver) to your Shopping Cart. The ThiEYE i60 action camera takes you beyond full HD in to the realm of 4K video recording. With Ultra HD video you will have a picture that full of life to relive those memorable moments in their true glory. The i60 from ThiEYE bring incredible footage thanks to its cutting edge SPCA6350M chipset and 4MP Sony CMOS Sensor. Now you can enjoy superior video with pin sharp focus, rich colors and fantastic resolutions as it can record in 4K at 25FPS or take Full HD video at 60 FPS so no detail will be missed in those fast paced actions shots. Whether you're making a cute cat video, careening down hill on your bike or riding the crest of a wave the i60 will capture picture perfect footage thanks to its great image stabilization. Of course in these challenging environments the i60 Action camera needs reliable protection, which is why it comes with an IP68 rated waterproof dust proof and shock proof case that provides underwater protection to depths of 40 meters, (131 feet). At just 65 grams and no bigger than a matchbox this 4K action camera is exceedingly portable and a fraction of the size of an traditional camera or SLR. With a full host of mounts and fixtures you can strap it to your body, bag, cycle helmet and capture stunning FPV videos of your greatest adventures. The cameras 1.5 inch LCD screen makes it easy to line up shorts and provides instant playback for your photos and movies so you can be sure you got the perfect shot. With its 152 degree wide angle lens you can fit so much more in your shot. A 1050mAh battery brings up to 1.5 hours of shooting time while 32GB micro SD card support provides all the storage you'll need. With Wi-Fi connectivity sharing photos and movies to you Smartphone, tablet or computer couldn't be easier so keeping your follower updated with your exploits will be just a few clicks away. 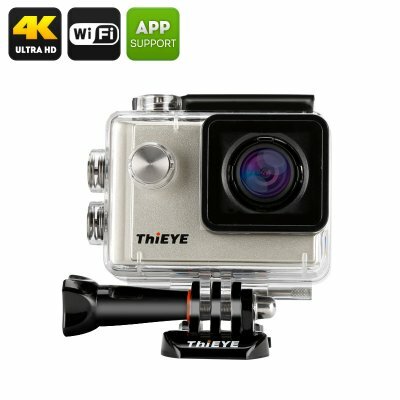 The ThiEYE i60 4K Ultra HD Action Camera comes with a 12 months warranty, brought to you by the leader in electronic devices as well as wholesale action cameras..